The consolation you hope for is that these uncertainties don’t end up making a difference. That way, you can talk about them, and you can investigate them, but you don’t have to worry about the results hinging on a decision one way or the other. It worked a little like that with the Rangers’ weird go-ahead run in Game 5 of the ALDS — as strange as that was, the Blue Jays still won, so it didn’t really matter in the end. Of course, that wasn’t true uncertainty, because the rules weren’t ambiguous. It was an unfamiliar play, but a legitimate run. With Edinson Volquez’s last full-count pitch to Jose Bautista in Wednesday’s sixth inning, there’s no getting to that point. You can see in the pitch whatever you want. And you can say, all right, but the Blue Jays won by six. You can say, even as the pitch was being delivered, the Jays were heavy in-game favorites. You can try to claim the call didn’t end up too significant. But the call, in the moment, was huge. It was the difference between bases loaded and nobody out, and two on with one out. The score, you’ll recall, was 1-0. If the Royals get the call their way, maybe the inning is completely different. Maybe the Jays score, but not too much, and they have to turn to David Price out of the bullpen. The game and series didn’t turn because of one pitch, but that one pitch did some of the pushing. That one pitch was also the very definition of borderline. The only thing we know is Volquez’s breaking ball was perfect. What happened? Unfortunately, it’s a mess, in a very baseball way. To quickly set the scene — there’s an argument Volquez shouldn’t have even still been pitching. It was 1-0 Jays in the bottom of the sixth, and Volquez was going through the order for a third time. His stuff was playing up, but at the end of the day, he’s still Edinson Volquez, and to start off he walked Ben Revere. He then immediately hit Josh Donaldson. Sabermetrics tells you Ned Yost should’ve gone to his deep bullpen, especially with an off-day coming. The probability of survival would’ve been better. But on the other hand, remember that it was Kelvin Herrera who coughed up the big double later on to Troy Tulowitzki. The game is played by the players. And I’m not even here to talk about that. I’m supposed to talk about Bautista, who was up next. He went up against Volquez, with nobody out, and men on first and second. 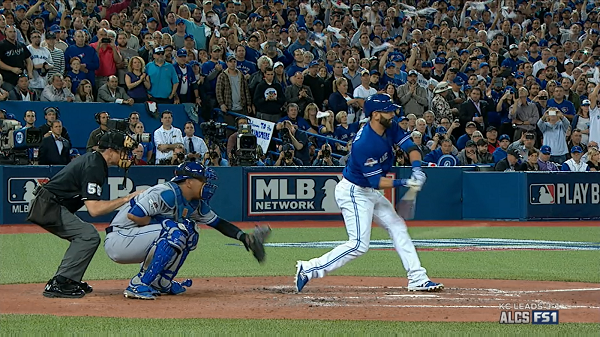 Bautista had the fastball timing down. It might’ve been just a matter of time before he figured out the movement, too. Volquez called Salvador Perez out to the mound, and they decided to go with a breaking ball. Volquez’s tenth pitch — a curve — couldn’t have reasonably been much better. I can’t stop watching this, for the glory, and for the heartache. There are actually two points of argument. The Royals wanted an appeal they never got, but it didn’t look like Bautista committed to a swing. And then there’s just the way the pitch was called. Bautista took his walk. The Royals wanted a strikeout. With the walk, the Jays’ odds of winning the game jumped to 88%. Had that been a strikeout, the odds would’ve dropped to 78%. A 10-point swing isn’t everything, but it makes a difference when the losing team has the bullpen getting hot and a lineup known for its unkillability. What this is, obviously, is a matter of the strike zone. Generally, when you get a questionable call in a baseball game, you’re able to research deep enough to find out what would’ve been correct. You can’t do that here. Not conclusively. Not with the systems we have set up. You’re inclined first to turn to PITCHf/x. PITCHf/x is better than our own naked eyes. 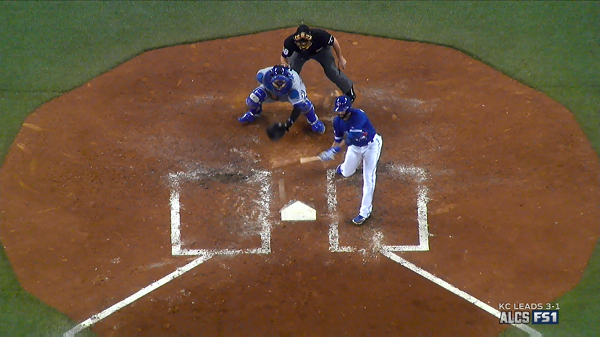 According to the cameras, Volquez’s breaking ball crossed the front of home plate 1.52 feet off the ground. And according to the system operator, the lower boundary of Bautista’s strike zone was 1.62 feet off the ground. The former is lower than the latter, but then you should also fold in the radius of a baseball, which is a little under an inch and a half. Do that and you get a hair of overlap. Do that and you get the argument for a strike. A sliver of the baseball allegedly came into non-literal contact with a sliver of the zone. That’s all that’s required. If only it were really that simple. PITCHf/x’s measurements aren’t perfect. PITCHf/x’s operator-set strike zones aren’t perfect. There are error bars around everything. So it’s worthwhile to examine the precedent. I looked for similar pitches thrown to righties over the last three years. I looked for pitches within a horizontal and vertical half-inch of Volquez’s pitch to Bautista, to see how those went down. Of the pitches that were taken, 39% were called strikes. Just this year, that rate was 47%. There’s only a very small sample of such pitches in full counts. About half of them were strikes. But we can try to be more precise. Volquez threw a curveball, right? So now let’s look at non-fastballs. Of the pitches taken, 29% were called strikes. Non-fastballs sink more, and they can be harder to receive, so it’s not a shock the called-strike rate is lower. But still, it’s not anywhere close to 0%. And there’s this nugget — of the non-fastballs thrown around that location in full counts, hitters swung at 89% of them. They almost demand protection swings. Bautista stopped his just in time. It was, in so many ways, a perfect pitch, in a perfect spot to that hitter. 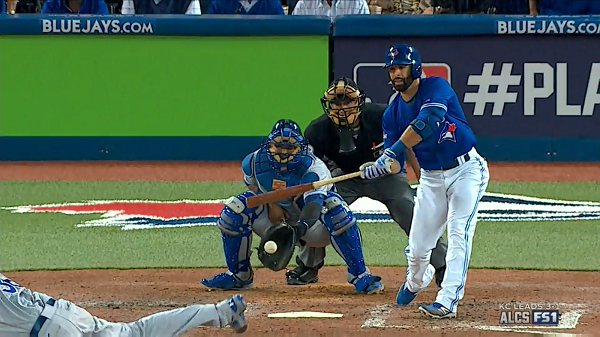 And then for Bautista, it was also a perfect take. Almost nobody has the stones to lay off that pitch. Almost nobody has the eye to lay off that pitch. Volquez couldn’t have executed better, and Bautista couldn’t have executed better. Somebody had to lose. As you probably know, the rule-book strike zone isn’t the strike zone that we see actually get called, but it gets to be all about the rules when you look at something this closely. It’s like those tag plays at bases where the runner comes off for a fraction of a second. Imagine, for the sake of this exercise, that you’ve been asked to review the pitch. You have the video, and you have the rule book. What do you say? The ball is on a downward trajectory, but you see it blurry here around the front plane. Is that at the hollow? Where do you assign the hollow? Keep in mind this angle, too, is off-center. Just to make it as complicated as possible. If the pitch caught the zone, it ever so barely nicked it. But then, if it ever so barely nicked it, that’s a rule-book strike. It honestly doesn’t get closer than this. Not by any meaningful extent. And because of the way the zone is handled, there have to be gray areas. You can’t have exact strike-zone boundaries, because humans can’t call that, and not even the machines are that accurate. There will be areas where a pitch is a strike roughly half the time, and a ball roughly half the time. I don’t know the solution. There isn’t an easy solution. Thankfully, there aren’t that many of these pitches. But that doesn’t help when they actually take place. The home-plate umpire called a ball. According to Volquez, the ump later told Perez he should’ve called a strike. That’s another way of knowing this was a perfect borderline pitch. The ump couldn’t make his call with conviction. No one could’ve. No one, at least, in their right mind. Volquez couldn’t have thrown a better curveball. Bautista couldn’t have pulled off a better take. And that’s as far as we can go. Bautista’s excellent discipline put us in this place. If he were an ordinary hitter, he would’ve swung at the curve, and something else would’ve happened. But, no. That would’ve been too clean. Baseball has to make it complicated. We hoped you liked reading Edinson Volquez Threw a Perfect Pitch by Jeff Sullivan! He’s said that he checks for himself after games sometimes and he’s right 70-80% of the time. I forget where I heard that though. I am sure if Bautista says that he is right 70 to 80 percent of the time then the actual number he is right is much less. Also, did he consider the ball 4 call last night a strike or a ball? And how does he check the calls? The FS1 pitch tracker? The fangraphs pitch chart? Brooksbaseball chart? Or does he check the PITCHf/x coords? Bautista said after the game it was a borderline pitch that went his way….so he was pretty spot on. Make a TV show about Joey Votto and Jose Bautista becoming umpires. That is all. Haha. That would be as much fun as John McEnroe as a line judge.